Few in Sarasota ever visit Warm Mineral Springs. Yet thousands of Eastern Europeans have settled in North Port because of the legendary healing benefits of this murky little pond. Iszchan Nazarian goes by "John." He likes natural things. He pickles his own okra and drinks raw goat milk with honey. 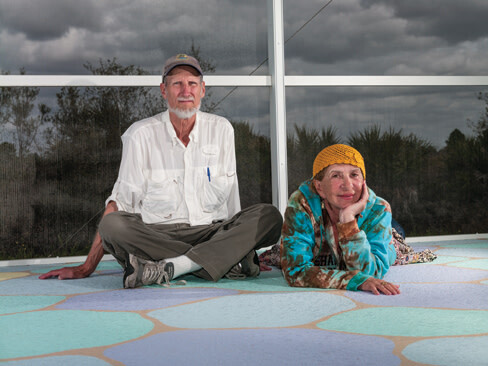 Raised in Armenia and apprenticed in tapestry and painting at the Warsaw Academy of Fine Art, John, along with his Polish wife, Elizaveta, who goes by Elizabeth, lives in a house just down Ortiz Boulevard from Warm Mineral Springs. A perennial "For Rent" sign is staked out front advertising the properties he owns in the area. This is how he lives his life: He rents out homes, he paints, he swims in the mineral springs. One of John's two paintings of the springs hangs in North Port's City Hall, and the other in the front foyer of their home. The second painting is more personal and abstract than the realistic landscape on public display. The palm trees are slightly cartoonish, and amorphous shapes and milky plumes dance across the water. Artist John Nazarian. Photo by Sean Salyards. Elizabeth Nazarian. Photo by Sean Salyards. 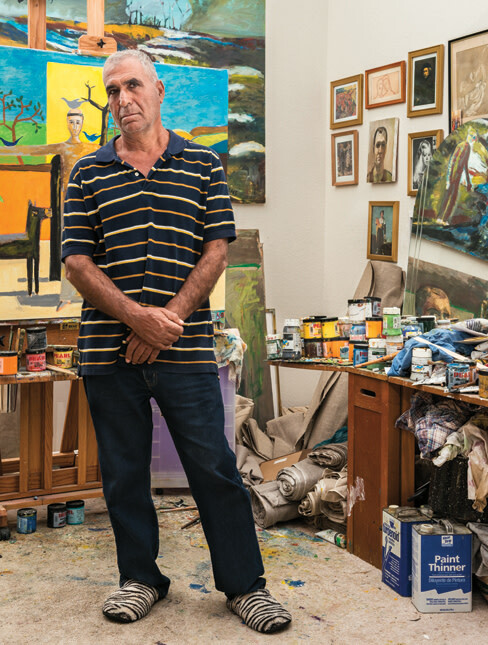 In his studio, adjacent to their living room, canvases are stacked six and seven deep all around—self-portraits and still lifes and studies in color and shape. In a variation on The Return of the Prodigal Son, John depicts an obscene Cubist Picasso prostrating himself before Rembrandt while Dali, Van Gogh and John himself look on. Photos of John's family and his teacher from Warsaw, classical music CDs and sketches of nudes litter his desk. His tapestries drape a weight bench and treadmill, and a life-size wooden Virgin Mary and two larger-than-life-size crucified wooden Jesuses anchor a shrine in the corner. John and Elizabeth are devout Catholics. Elizabeth likes to show visitors a photo of her standing next to a poster of former Pope John Paul II, to whom, she says, she bears a striking resemblance. John's brothers live in Los Angeles, and when I suggest to him, over lunch at his house—cabbage rolls stuffed with turkey and freshly caught fish—that it might be better for his art career if he lived there, he says, "We fall in love with this lake. This is unique something. You cannot be there and swim here." He recently traveled to Chicago, a city he called home for many years before moving to North Port in 2000, to pick up a painting from an exhibition. The weather was cold and windy. There was no grass. He missed the springs. "It was like going from Eden to hell," he says. He slipped out of the hotel at 1 a.m. and drove straight back in time for his daily swim. Elizabeth is an activist for Eastern European orphans. Several commendations for her work from, among others, Chicago Mayor Richard M. Daley and the President of Poland hang on the walls interspersed among John's art. 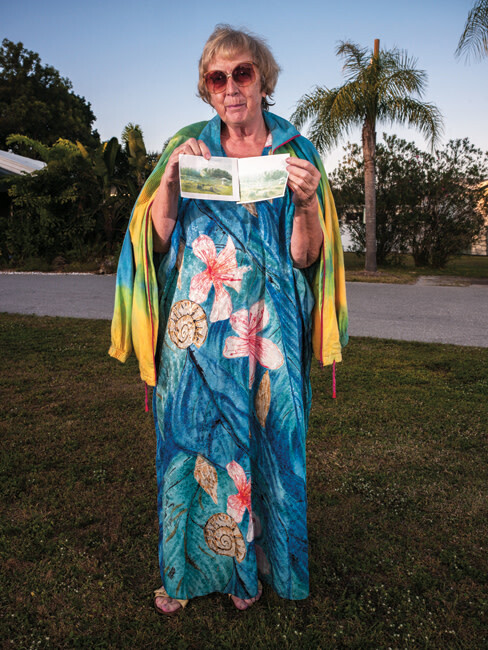 Eastern European immigrants, many of them, like Elizabeth, drawn by the healing waters of Warm Mineral Springs, now comprise a "significant" portion of the area's population, says County Commissioner Christine Robinson. According to 2010 U.S. Census data, about 9 percent of North Port's population of 59,000 is of Eastern European ancestry. Robinson used to work in the county prosecutor's office in the early 2000s and says that at that time, the Warm Mineral Springs area had a troublesome reputation, with lots of burglaries and drugs, but now it's occupied largely by quiet Eastern European families. "It's completely different," she says. There are two Ukrainian churches in the area and, along Tamiami Trail, no fewer than four stores dealing exclusively in specialty products from Poland, Russia, and Ukraine—freshly pickled cucumbers, kefir, smoked fish, caviar, pierogies, farmers' cheese, beer, chocolate and more. And lately, a hot topic of conversation among shoppers has been the threat that their beloved lake may soon become a casualty of a political skirmish between Sarasota County and the City of North Port. Elizabeth is currently collecting signatures—more than 1,000 as of March 14—for a petition that the Florida Park Service take over Warm Mineral Springs. The petition, while unlikely to have an effect, sends the message that the community of Eastern European immigrants here cares deeply about the fate of Warm Mineral Springs, that it's the very reason the Nazarians and many others gravitated here, first as tourists then as residents, citizens and community members. The joint owners of Warm Mineral Springs, the City of North Port and Sarasota County, find themselves at an impasse. The concessionary lease of the current operator, Cypress Lending Group Ltd., expires June 30. Last year the city and county agreed to invite proposals to manage the springs, but an election last fall changed the make-up of the City Commission, altering its position. The county commissioners still want to seek proposals and have offered to buy out the city's share of the springs. The City Commission's position has been less clear, but it rejected the county's offer to buy the springs and has proposed seeking short-term management proposals. At press time, the two sides were in mediation, and some have proposed a 50-50 division between the city and county of the 81-acre property the springs occupies. Many believe that old scores and vendettas are effectively jeopardizing the fate of the springs, the engine of the local tourism industry, and the locus of the Eastern European community here. "They," Elizabeth says of the North Port city commissioners, "don't know what we have here." "They are ignorant," John says. "If lake closed, I will leave. I am here only for this lake." "We swim every day of our lives," Elizabeth says. "And we will go to the jail, we will jump through the wall to swim in this spring." When you look up Warm Mineral Springs on Russian websites, it's referred to as Chudo Ozero. Miracle Lake. Miracle Lake is, technically speaking, a cenote, a sinkhole. It's fed by at least three vents, one pumping 95-degree water that keeps the temperature of the entire spring in the mid to upper 80s year-round, dredging up countless minerals and sulfur gas believed to cure everything from stress to psoriasis to kidney problems to slipped discs to cancer. Nine million gallons of water per day flow out of the springs, into the Myakka River and out to the Gulf of Mexico. Like several other springs in Florida, Warm Mineral Springs is rumored to be the fabled Fountain of Youth that Spanish explorer Ponce de Leon sought. There is little doubt that the minerals in the water are healthful, but there are no conclusive scientific studies on the medical and health benefits of the waters. Warm Mineral Springs is also one of the most important archaeological sites in the country. During the Pleistocene era, when Florida was much larger and drier and the water level in the springs lower, Warm Mineral Springs was an oasis and may have been a Paleoindian mortuary pond. Archaeologists have found human skeletons dating as far back as 10,200 years; and, encased under plastic and sand, preserved below the feet of today's swimmers, are the prehistoric skeletons of a sabre-tooth cat and a giant ground sloth. Up top, Warm Mineral Springs is grassy and serene, producing, for a hole in the ground, a surprisingly profound sensation of calm. Algae collects along the banks, and phototropic effects turn the water milky later in the day. Then there's the strong scent of sulfur. After the water dries on you, it makes your skin smell like an old tire. This, along with the price tag, $20 a day with special rates for 10-day passes and local residents, turns off a lot of would-be American tourists. But it's precisely the sulfur and this natural effect that many of the Eastern Europeans appreciate. One of the widely heard complaints about the springs is, in fact, that the sulfur smell has dissipated over the years. "Before, if you come here, you feel it on the air," John says. "Now"— he sniffs—"only a little bit something." Faina Ridgway climbs out of the springs, a long scar snaking down her thigh. The sun's glare off her golden, rhinestone-studded cap makes it impossible to see her face. The day is about as cool as it gets in North Port, 42 degrees. In her hometown of St. Petersburg, Russia, the temperature right now is six. Her American husband, Ellis, picks her up—she would walk except she recently had hip surgery—to drive her to their purple-and-yellow stucco house a few blocks from Warm Mineral Springs. Inside, photos from their travels cover every inch of wall space, even in the garage. They have cross-country skied across the largest freshwater lake in the world, taken the Trans-Siberian Railway from Moscow to Beijing in the dead of winter, slept in a Swedish ice hotel, and spent New Year's in the Santa Claus village in Lapland. There's a photo of Faina swimming alongside an iceberg and a plaque certifying her as an honorary member of the North Pole's Arctic Polar Plunge Club. Their business cards dub themselves "World Wanderers and Wonderers." They call North Port home. They visited Warm Mineral Springs after a fellow émigré had recommended it to Faina. "With Russian people," she says, "a friend always tells you where you should go." The springs made a strong impression, and five years ago on an impulse after they retired from their jobs in Richmond, Faina suggested that they move here. The couple had traveled to spas and springs all over the world—Karlovy Var in Czech Republic, Baden-Baden in Germany, Staraya Russa in Russia—but Faina liked the fact that at Warm Mineral Springs, where it's always summer, she could swim in the mineral-rich water year round. Ellis was less enthusiastic about the idea. He didn't put much stock in the healing powers of the lake. "Europeans have always believed in nature," Faina says. "Americans believe something else. When my husband has a little headache, he goes right for a pill. I would take a walk." 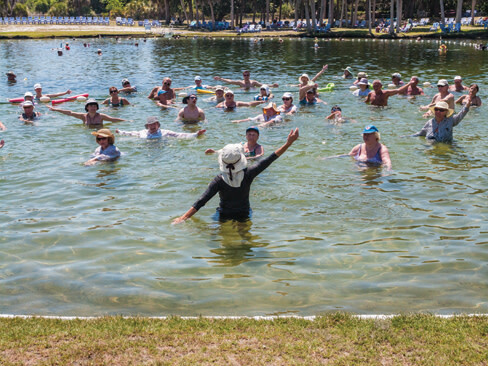 Later that morning, back at the Springs, a staff member leads a Tai Chi class from the shore while a group of elderly Slavs clumsily parrot his movements in the water. Others, chattering in Russian and Ukrainian (something about sharks and crocodiles), shuffle down a ramp into the water past a sign that sends conflicting messages—the obligatory "Swim at your own risk" liability warning is right above the springs' trademarked motto, "You'll Feel Better." Synthesized New Age organ music drones across the clearing from speakers tucked into a grove of palms. A bored lifeguard yawns loudly. The rotten-egg smell of sulfur wafts on the breeze. There are only about 70 or so people floating in the water (capacity is 385), another 50 reclining in plastic Adirondack chairs along the banks. At certain times during the season, entire busloads of Polish and Russian and Ukrainian tourists come down from enclaves in New York or Boston or Chicago. Since Cypress Lending took over management in 2010, the springs has been mentioned as one of the top mineral springs in the world by Health magazine and The Huffington Post; and attendance is up, from 40,000 in 2009 to 119,000 in 2012. The vast majority of visitors are still Eastern Europeans. "Without them this place would have been boarded up and closed," says Gene Vaccaro, general manager of Warm Mineral Springs, who sports a Tommy Bahama-style short-sleeved black button-up shirt over bright white pants. "They are this place's salvation, the only ones who understood all along the power of the water." Even beyond the perimeter of the springs itself, within a couple mile radius, Americans are the tourists, and the Eastern Europeans are the locals. Judd Roth, one of the few American regulars at the springs, knows it. "We're statistically insignificant, the few of us," he says. He wrings out his wet shorts and dons his beige hat with flaps and shades with side panels. He wraps a red bathrobe around himself. He remembers coming to the springs 30 years ago when groups of Eastern European tourists careened around singing folk songs in unison. He lives two streets behind the springs and commutes from Pennsylvania, where he has another house and runs a real estate business. Most of his neighbors are from Russia and Ukraine. "When I'm here, about half the year, I swim every day," he says. "I swim 45 minutes, go to work, then come back. The water has a great benefit. It's subtle, but it's there." Lifeguard Chris Bender's uncle used to own the springs, and Chris moved here to help run the family business 11 years ago. He stayed on when the ownership transferred. Chris knows many of the regulars well, down to their precise routine. He knows John Nazarian will swim about 15 times from rope to rope. He knows Faina Ridgway will slowly circle the pool a half dozen times, wearing one of her brightly colored hats and chatting with friends. He knows those who came here as children and who now bring their own children. He gets invited to a lot of multi-course Ukrainian dinners, featuring traditional favorites like pancakes and cabbage pies and beet salads. It's not the most exciting job around, and it's sometimes made more difficult because he can't always communicate with the people he's charged to protect. "A lot of folks are on meds," he says. "There's been a couple cardiac arrests. The No. 1 reason I jump into the water is for someone who gets a foot tangled in the rope." Not everyone in North Port's Eastern European community visits the springs. But almost all of them moved here, opened their businesses and established their lives in North Port because of the other Eastern Europeans that the springs attracts. Anastaysia Lendel (right) with Alina Spotar. Photo by Sean Salyards. Alina Spotar, 18, an employee at International Food, the biggest North Port Russian store, was born in Odessa and moved to North Port with her family when she was six. "I've been once," she says of the springs. "It's not my thing. I go to the beach." Her coworker, Anastasiya Lendel, 25, who moved here 12 years ago from Dnipropetrovsk, says that the springs are for old people. "I've never been," she says. "I've never heard of anyone my age going to the springs. The young Ukrainians go to church mostly, and a lot of young people work." Other Eastern Europeans around the country take any chance they can to take a dip in Miracle Lake. For example, some Eastern European truckers make Warm Mineral Springs a pit stop on their cross-country routes. 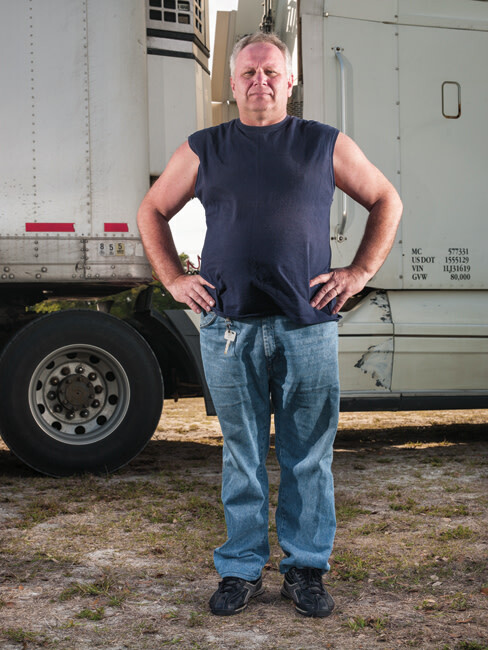 Eighteen-wheeler driver Peter Feshchenko, originally from Lvov in Western Ukraine, lives in Seattle. He carries apples from Oregon to Miami and flowers from Miami to British Columbia. He parks his truck in the springs parking lot, and the compressor automatically roars to life when the temperature hits 65 to keep the flowers cool. "I spend several hours and then back on the road and feeling much better," he says. "Feeling muscles relaxed, not stiff, positive. Many drivers stop here and feeling better." He has family who live here, but that's not the reason that he stops through. "I'm not visiting for cousins," he says. "I'm visiting for springs. I want to spend time at springs." Mary Putnik. Photo by Sean Salyards. Peter Feshchenko. Photo by Sean Salyards. Like Faina and Ellis and Elizabeth and John, Mary Putnik and her husband, originally from Serbia, heard about the springs from fellow Eastern European friends while living in Chicago. After one visit, they bought a house here and moved down, leaving their jobs. He worked in tool and die, and she did electrical engineering for pinball machines. Mary took a part-time job as a housekeeper at the springs to have free admission. During the next 19 years she went from being housekeeper to gift shop clerk to cyclorama operator to assistant bookkeeper. Now she is the operating manager of the springs. "Overseas springs are different—all medical buildings and mostly indoor and you have to have a doctor checkup," she says. "People cry leaving this place." 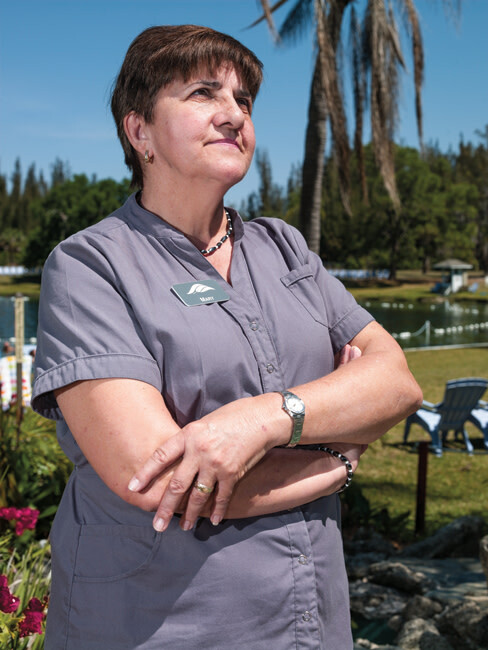 One of Mary's jobs at Warm Mineral Springs is to boil down the salts. She fills four big stockpots with water from the lake and boils off the water, leaving the sediment. She scrapes it off the sides and bakes it in the oven. The fine salt has a sharp taste with no hint of sulfur at all. They store it in plastic bins of rice to absorb the moisture until it's shipped out to companies that make it into the various gift shop products—chocolates and spice mixes and cosmetics. Mary planned to retire on her 20th anniversary of employment at the springs in May of 2014. Whatever the outcome of the city and county conflict, she hopes that she still can. In some ways, North Port and the lake remind painter John Nazarian of his homeland of Armenia. "A warm place," he says. "Because my country was warm. Light and sun. I like light. And warm and nice. And all year green. Clean air. No factory." At 67 years old, John says, "I feel like 25." He swims a minimum of six days a week. He's become a circuit in that word-of-mouth circuit board of Eastern Europeans who tell other immigrants where they should go. "I tell friends, if you like to be healthy and younger, you have to come here," he says. "They believe me because they are seeing this and feeling this. And if they come one time, they come again." Living close to the springs has somewhat endeared Ellis Ridgway to it. When the weather is warm, he may do a water aerobics class there. At the very least, he figures, it does no harm. "I think the only dangerous thing is alligators, but the staff chases them out in the morning," he says. The springs may never mean as much for Ellis or for the majority of Americans as it does for his wife, Faina, or the other Eastern Europeans who've moved here because of it. For Faina, Miracle Lake is part of her everyday spiritual practice, something around which she builds her life. "It's discipline," Faina says. "It's religion. It's first thing in the morning—so that I am not diddling around the house. For me to be functional. It's my ritual. I couldn't ever think that I won't go to the lake today." Jeff Parker is the author of the novel Ovenman and the story collection The Taste of Penny. He lived and worked in Russia for many years, and his forthcoming nonfiction book is called Igor in Crisis: A Russia Journal. He first soaked in Warm Mineral Springs while a fellow at the Hermitage Artist Retreat.